Figured I would get more use out of this blog and not only post class assignments. Here is an attempt at a tank. Its clear to see that it is not complete and I add more to it as we learn more of the tools in maya. I don't like the way the turret is coming along so i'll most likely be remaking it. I'm thinking of going for a non-asymmetrical style where the cannon is house more on the side instead of evenly centered. 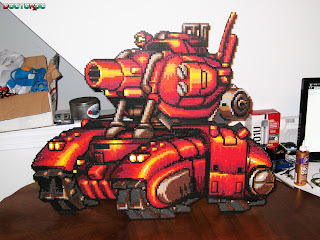 Below is an image of a tank from the metal slug games. I was using it as a base for the side tread covers as well as the main body.